The brief conversation in the park was rather different from many of the on-street discussions I have with New York City drivers. Having wished him a good day in return, I pushed my bike towards a bench, rummaged in my pannier bags and got out my lunchtime sandwiches. 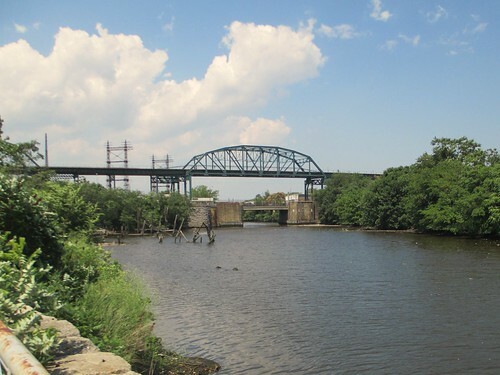 I ate my lunch contemplating the scenery – if that’s not too strong a word - of the Bronx River. The older man continued an animated discussion with a friend in Spanish. 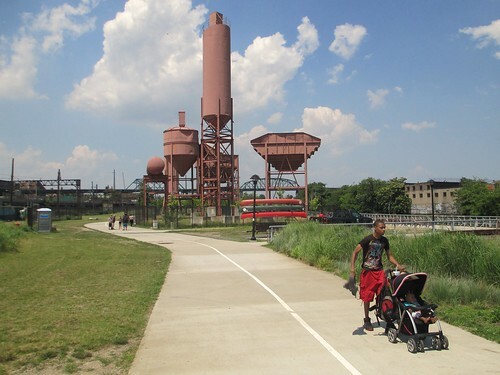 The interchange in Concrete Plant Park was one of many joys of my bike ride this past Saturday almost all the way across New York, from my home in Brooklyn, to City Island, in The Bronx. I enjoyed stunning views, weather a little less stifling than the city summer norm and arrived at a charming New England fishing village strangely marooned in the city. However, the aspects of the trip that stood out weren’t those I’d been anticipating. I’d expected to explore New York’s relationship with the inlets of the sea, rivers and islands that define the city’s unusual geography, confining high-rise Manhattan to one small island and allowing other parts of the city to sprawl. I came back with a still more powerful sense of the city’s remarkable atmosphere – of its people’s readiness to engage, their straightforwardness and their sense of fun. My only regret is that the city still hasn’t properly harnessed its people’s vigour and enthusiasm to a serious effort to make its streets safer. That feeling is all the more intense because I came on my way home on the aftermath of a car crash. While it seemed to have had no serious consequences, it could easily have killed someone. I headed out partly because I was lonely, after my wife and children went to visit family in the UK, and because I wanted to regain some fitness after being off my bike for two weeks in June with a broken foot. giraffes round a watering hole - or something. I planned my route to take in all the city’s boroughs, except for Staten Island, and a series of different land masses. I would start on Long Island, where I live, cross over onto Manhattan Island, then the twin, linked Randall's and Wards Islands in the East River. 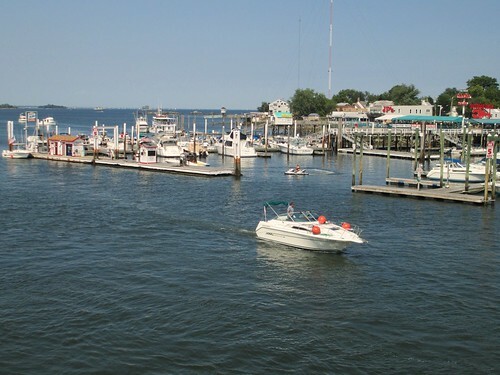 Then I’d cross onto the US mainland in The Bronx and finally out onto City Island in Long Island Sound. I was particularly determined to have a positive experience after someone suggested to me I always made New York sound an appalling place when I wrote about cycling here. I had the idea for the route because I’m struck by how it’s the areas where it’s impossible to build – the East River, the Hudson, New York Harbour – that give the land in the city its sense of place. Some of the city’s densest, highest-rise areas are crowded round the water, as if the buildings were so many giraffes, crowding round a drinking hole. The meandering Thames and the city’s other rivers and canals give parts of London a similar feeling. But there's nothing there quite as spectacular. The moments of greatest drama were indeed bridges that swept over key canals and inlets of the sea. The Pulaski Bridge carried me over Newtown Creek from Brooklyn to Queens, with a dramatic view of midtown Manhattan to my left; the Queensboro Bridge soared high above Roosevelt Island in the East River; the graceful 103rd St foot and cycle bridge carried me from Manhattan onto Wards Island, in the centre of Hell Gate at the junction of the East River, Harlem River and Long Island Sound. I was struck anew as I rode – but not surprised – by the influence over the city of Robert Moses, the powerful – unelected – official who shaped planning for New York City and state between 1924 and 1968. Moses was a passionate fan of open-water swimming, roads and parks. It was unmistakeable how that trio of interests had led him to make particularly wrenching changes to the bits of the city nearest the water. 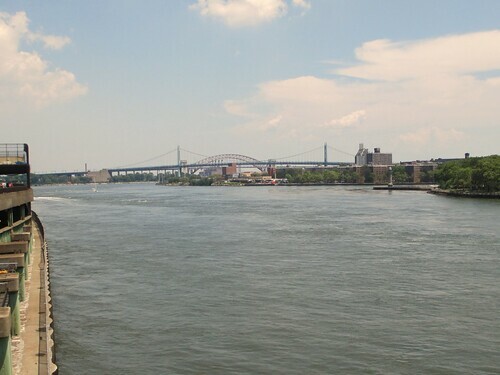 As I rode up by the East River in Manhattan, I was pedalling at one point on a promenade that Moses built above a section of East River Drive that he designed, looking across towards Randall's and Wards Islands, which he entirely reshaped, and at his Tri-Borough Bridge. But a different sensation started to creep over me. It began with the driver in Cobble Hill who carefully waited for me to start when some lights changed and I was stuck behind a car. “You goin’?” he asked politely, before letting me move off. It continued with the man in Concrete Plant Park. Then I noticed a man ahead of me as I rode along the Pelham Parkway in The Bronx. He was an almost laughably complete picture of how people would imagine a cyclist from the area that first spawned rap should look. His baseball cap faced backwards and his BMX bike was so tiny he had constantly to stand up. Yet he was looking, like me, to get somewhere particular, as fast as he could. I advised him to follow me. can there be nature that's also grittily urban? Again and again as I rode, I was aware of how the city’s people were working as hard on this hot, not-too-humid Saturday at enjoying themselves as they would during the week at their jobs. As I returned home through Concrete Plant Park, I stopped to fill my water bottle at a drinking fountain and interrupted a girl – maybe three or four – filling a vast pile of water balloons. Her mother, who was assiduously helping her, told her in Spanish to wait while I filled my bottle. Then the great task – whose ultimate goal was unclear to me – continued. Other parks were full of the elaborate barbecue parties that will be familiar to anyone who knows New York. Moustachioed fathers were lugging big grills into position while women fussed over coolers full of marinating meat. Sound systems blared Latin music. 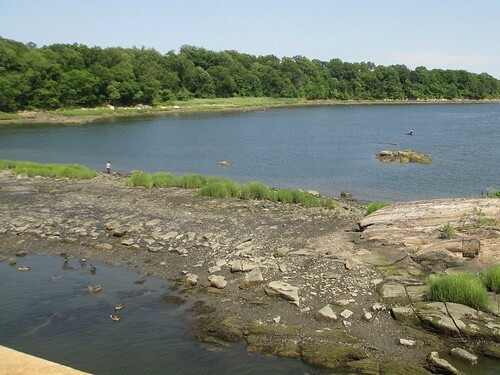 It was almost an anti-climax after immersing myself in the vibrant, multi-ethnic atmosphere of The Bronx’s parks to ride over the bridge onto City Island and find a neat suburb of clapboard houses and seafood restaurants. I rode down to the island’s tip, took some pictures of the seagulls flocking round the seafood restaurants, then rode back up the island to the Lickety Spit café. The ice cream felt well-earned. The streets grew more and more crowded as I headed south and the sun sank in the sky. 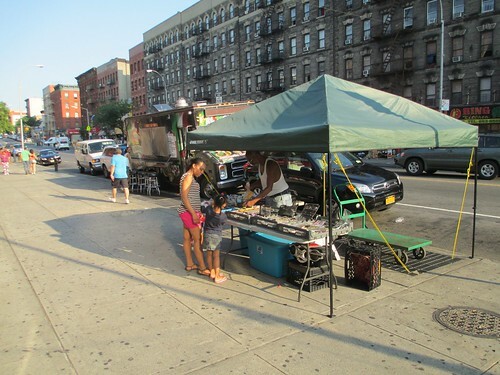 In East Tremont in The Bronx – an area where Robert Moses’ cross-Bronx expressway wreaked particular social devastation – there were little knots of people out on the streets, gathered round attractions whose significance I didn’t understand. 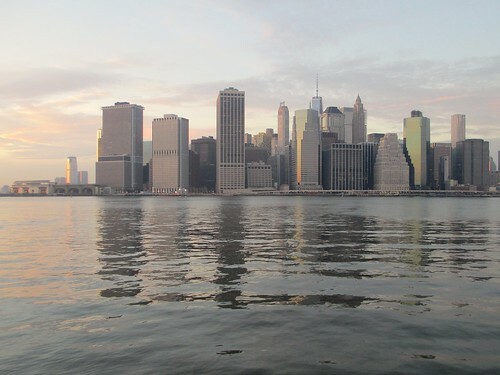 I was feeling, I realised, the flipside of the atmosphere in New York that makes drivers short-tempered and intolerant. Its being a hard and uncompromising place to live, I began to feel, gave many of the city’s people a directness and determination that felt life-enhancing and exciting to be around. New York has a way of pummelling the timidity and shyness out of one. Yet, perhaps inevitably, I was to come across a reminder that that frankness and directness don’t always mix well with being on the roads. 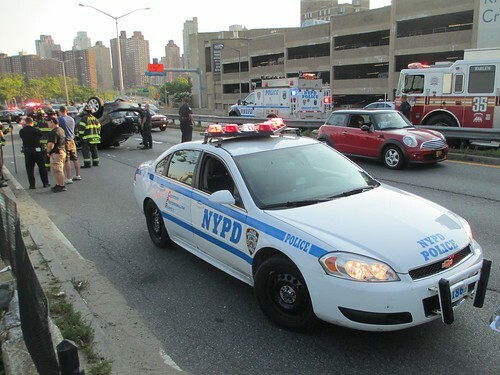 As I rode along the East River shore of northern Manhattan, I noticed an unusual number of emergency vehicles heading south on the adjoining East River drive. Rounding a corner, I found a group of them working to turn back upright an car overturned in the lanes nearest the cycle path. “It just started turning over,” I heard the clearly stunned – but thankfully not badly hurt – driver telling an ambulance crew. “People think they can drive any speed and nothing will go wrong,” I remarked to another onlooker, trying to put across a road safety message. He wasn’t ready to hear. It was a response that, under some circumstances, I could have found depressing. It’s dispiriting that so many people focus when thinking about their road behaviour on what they can walk away from, rather than what’s rational for them and those around them. I could also have grown frustrated at how many of the miles of waiting drivers I subsequently passed were leaning on their horns, as if their frustration would make the emergency workers go faster. But, even as I rode past the honking vehicles, I was taking in the different – but still positive – atmosphere of this far more prosperous part of the city. 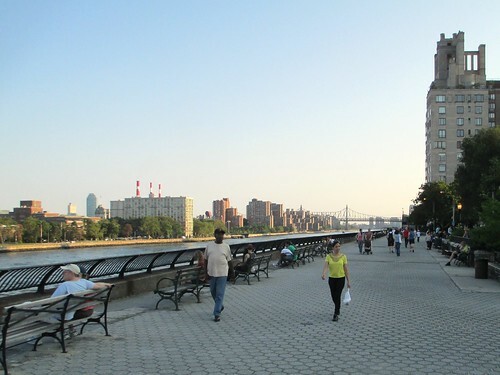 People sat on benches looking over the East River watching the powerful currents that tear through the area around the tip of Roosevelt Island. Residents of the Upper East Side wandered along the esplanade so calmly and contentedly in the setting sun that it felt almost like riding through an idealised architect’s drawing of a perfect urban scene. I noticed as I rode across the Queensboro Bridge how beautifully the bridge was reflecting in neighbouring glass buildings. It was, in the end, a round-trip of 56 miles on a day when temperatures reached nearly 30C. I arrived home hot, sweaty and feeling a keen need for the Chinese food I’d put aside that morning. But I’d worked at enjoying myself just as much as the grill-lugging fathers I’d seen in the parks, and I came home feeling more connection with the city’s alternately infuriating and endearing people than I’ve ever felt before. Perhaps, a voice inside me suggests, I am becoming a New Yorker. It wasn’t, in most respects, a particularly exceptional piece of abuse. The man leaned loudly on his horn, squeezed his vehicle through a narrow gap to my right, leant out his window and gestured towards the kerb. “You should be over to the side!” he shouted. But the abuse felt different for one reason. I wasn’t riding last Saturday on my own, as I usually do, but with my wife, the Invisible Visible Girl, 12, and the Invisible Visible Boy, six. The driver was harassing two children who’d been given limited choice about whether to come with us. He threatened them, effectively, with being run over for turning left. 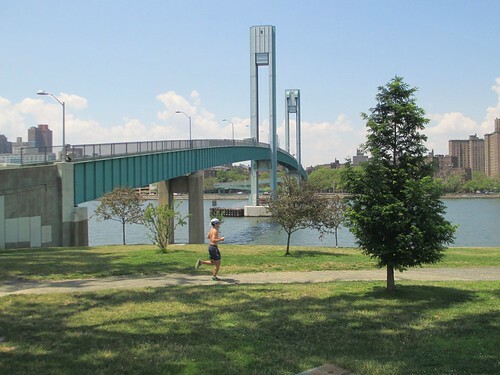 It was one of several incidents of low-level harassment we suffered as we rode from home to a Hudson River playpark and back, more slowly and cautiously than I would on my own. It felt – not for the first time – as if I was giving the children a harsh introduction to the hypocrisies of the adult world. They’ve heard at school and on television about how they should look after the environment and how cycling is a good way to do so. I’ve stressed to them the importance of responsible behaviour on the road. They’re led to believe that most adults want to protect children. Instead, we faced some motorists who felt entitled to scare us off the roads by brute force. While we tried to keep to the rules of the road and respect others, we found motorists turning across our path, driving dangerously fast and generally treating their legal and moral obligations to other road users with contempt. The overall atmosphere even made me feel irritated about one of the positives of riding with children. After they’d done a double-take at my son’s trailer bike, many passersby would smile or even give us a thumbs-up, responding to the sense of joy and freedom that children seem to feel when cycling. In light of the other behaviour, the friendly gestures felt somehow irritatingly superficial. It speaks volumes about quite how superb an experience cycling in a city with children can be that we still thoroughly enjoyed ourselves. 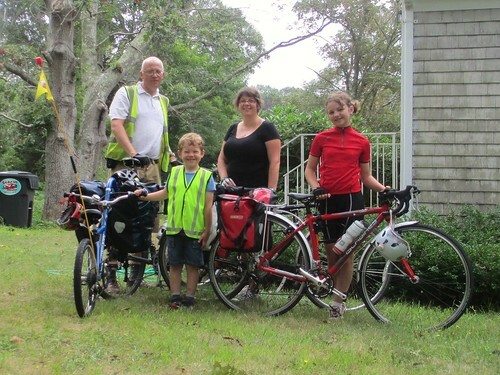 Part of the problem is that few parents in New York or many other big cities – including London, where we used to live – would even countenance undertaking a 12-mile, cross-city round-trip with two children by bike. I’ve read suggestions that parents who cycle with children in London should be prosecuted for child abuse. I remember one disapproving woman in London who saw me negotiating a junction in London (on foot, to reduce the danger) with my son and his trailer bike. “That’s so dangerous!” she said in a stage whisper. The thought’s the logical extension of the common, mistaken notion that cyclist and pedestrian negligence causes crashes, while speeding, telephone-using motorists are the hapless agents of fate. Parents who cycle with their children are somehow meant to be the only living creatures on earth who don’t care if their progeny survive. The disapproving woman in London presumed she cared more about my son’s welfare than I did. Drivers’ behaviour around cycling families is unlikely to improve until they’ve had more practice encountering them. 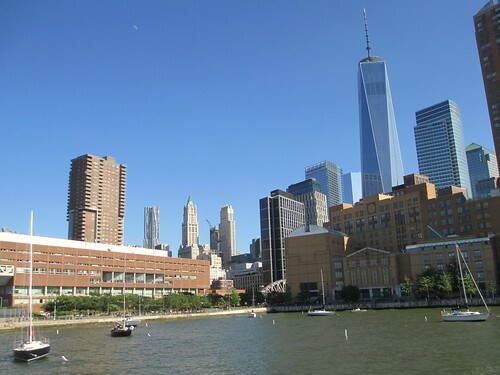 The view from Pier 25: worth a few hassles to cycle there. I'm carefully balancing the risks and rewards when I ride around with the children, however. I’m partly looking to the long term, when the likelihood is that a cycling habit will extend their life expectancy by far more than the risk of a crash will curtail it. I also undertake careful risk analyses. I thought carefully on Saturday about whether the roads would be quiet enough over a holiday weekend for the whole family to follow the route I take to work each day. We then headed a little further to Pier 25 on the Hudson. The trip brought immediate benefits. As soon as we set off, I was being treated to a burbling stream of the boy’s observations on life and the passing city. When might he fit his older sister’s old bike? Were we in Chinatown yet? Were we out of Chinatown? Why was it called Chinatown? Which floor in that building was my office? My wife, following behind, had the pleasure of hearing the Invisible Visible Girl, riding her own bike, reflect on the shops along Prince St in SoHo. It was as if the simple act of getting on our bicycles had wiped away the generation gap in perceptions and enthusiasms within the family. 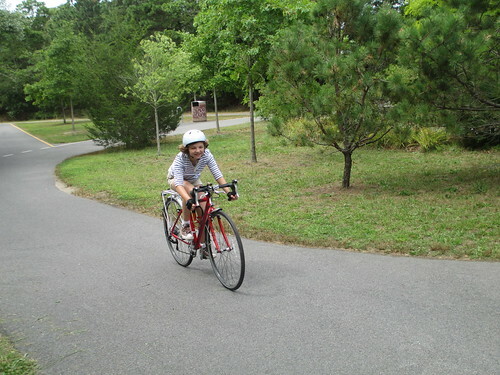 Cycling’s an activity for which many children feel an infectious enthusiasm. It lets adults – myself included – give free rein to their inner child. It’s one of the first activities where children exercise the adult responsibilities of getting about independently. It’s an activity where my modest mechanical expertise continues to give me hero status with my daughter, even as she draws close to becoming a teenager. I’m handing on to my children knowledge about bikes that I learnt from my father and that he learnt from his father before him. Because of how the experience bonded and relaxed us, I felt guilty when I lapsed into my stressed adult self at a few points in the journey. I found myself gesticulating, exasperated hands aloft, as a truck overtook us then swung right across our path at Spring St and Broadway. I gestured frantically at motorists lining up at the scary intersection of W Houston and West St not to try dangerous overtaking moves. It always feels unfair when I let the children see the more anxious, stressed me of points in my workaday life, rather than the in-control daddy I try to give them. Yet, after 45 minutes or so, we had reached the calm of the bike-only Hudson River Greenway for the short ride down to Pier 25. The boy splashed in the water to cool off from the 90F heat and humidity. The girl, who normally has her head in a book or her iPad, briefly tried out a climbing wall. 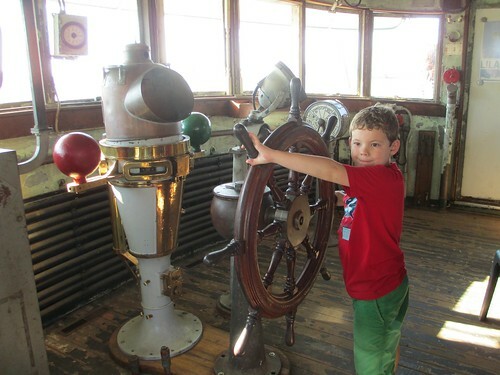 We visited an old lighthouse tender moored by the pier, where the boy made my heart sing by taking a close interest in the triple-expansion steam engine. Looking up at the lower Manhattan skyscrapers, it felt a privilege to be on bikes in this spectacular city. The incident with the honking driver – in Chinatown, as we returned to the Manhattan Bridge – detracted only a little from the day. It was hard, nevertheless, not to feel wistful as we returned home that the experience could not be easier and more straightforward. While I’m prepared to take the boy most places in the city on a trailer bike behind mine, I’ve so far turned down his requests to be allowed to ride alongside us on the sidewalk on his own bike on short, local trips. The girl, older and more attuned to the risks of the roads, never much likes riding into Manhattan because of the challenges of the traffic and impatient drivers. It would take relatively little improvement, I’m sure, to coax far more parents to get out their children’s bikes for family trips, rather than resort to the subway or a car. 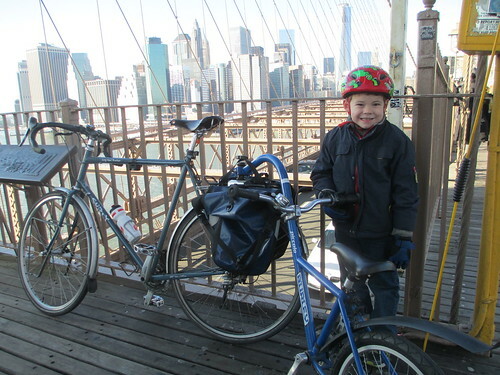 Even on Saturday, there were parts of the journey – on the Allen St protected bike lanes, on the Hudson Greenway, on the Manhattan Bridge – where I had no worries about the children’s safety. With further work, I might start feeling more confident about letting the boy ride on his own. With only minor improvements, I might start acknowledging on their own, friendly terms the thumbs up and smiles of well-meaning passersby.